of $35.00 (California residents add 6% sales tax). nutrition programs, you will find them priced upwards from $120. supporting files unaltered, as written by the author. Distribute only the Distribution Disk Files on page 6. 2. Do not alter the program and then distribute. Robert Savryk c/o NUTRITION QUEST for details. program when transmitted by telecommunication systems. 5. Copy NUTRIENT only on a private, noncommercial basis. 1. Mail or CompuServe support. 4. REMarks (~12K) to source code. 5. Bibliography (includes reliable food and nutrient data sources). second, food intake data such as food number and quantity eaten. the known nutritional needs of practically all healthy persons." vitamins A and D, and certain trace minerals. user in the distribution of the program. in its nutrient content and/or general characteristics. compared to the 1980 RDA (expressed as Percent of RDA). food values; foods by food group; and the entire Foodfile. READNUT2.DOC should be 51 pages. want to add foods to the current database. find it useful as a teaching tool. A brief description of each file can be found in APPENDIX A.
system DOS 2.0+ (using the /S parameter of the DOS FORMAT command). Also include its equivalent version of BASICA.COM. to load BASICA and NUTRIENT, but that's up to you. of your Working Disk, and copying the Distribution Disk files to it. BASICA NUTRIENT. That's it. Please enjoy. The documentation you are now reading can be printed or displayed. PAGE: width 8 1/2" height 11"
TEXT: width 7" left margin 1/2" right margin 1"
height 11" top margin 0" bottom margin 0"
Word Processor: see Print above. Personal Data files (A, B, C or ...)? letter to indicate which Disk Drive you want the files to be written. the main files are on drive A, then ENTER the letter B or C, etc..
capacity to hold several additional files from 7K to 23K each. Please choose a number (1 or 2)? Choose a selection by entering the number 1 or the number 2.
compatible, NUTRIENT may also run. Menu when done with this screen. 4. READNUT.DOC - This is a text/documentation file. Please read for more detailed instruction. DO NOT WRITE PROTECT DATA DISK. is not permitted on a copy distributed to another user. information for the proper running of NUTRIENT. CHOOSE A NUMBER FROM 1 - 8? NAMES with unique FIRST INITIALS. enter the letter C; or I if an infant. Press ENTER when finished. Enter the number of months's the individual has been breast feeding. one of two methods, that is, elbow breadth or wrist circumference. Body frame is not a measure of abdominal girth, height or weight. measuring device, consider the bone structure of the elbow or wrist. using S, M or L respectively. Press ENTER. must enter all personal data or errors may occur. the screen is in order. These two prompts will be seen on the bottom line of many screens. to the previous menu, or to the main menu (NUTRIENT'S MENU). backup once and retype data once. golfing, sailing, table tennis, volleybal. Keep in mind, no one usually spends 24 hours a day in one activity. his time in sitting activities. (Number of days to analyze(1 to 3)? Number of (Food Intake) days to analyze? data that will be entered below it, either by the computer or you. bottom line displays three prompts. that when you see the cursor, it is your turn to ENTER data. found in the FOODFILE database. Then it is your turn again. decimal fractions or multiples of the common UNITS. your keyboard while keying-in the Food Intake Screen data. particular screen, or choosing from a menu. prior menu, or to NUTRIENT's MENU. ENTER = END OF DAY This is, you guessed it, the END OF DAY prompt. ENTER key you will exit to the main menu (NUTRIENT's MENU). foods from the database, or expanding the database. is an instruction to key-in your food's data within the brackets . found here. Key in the new food's description (within the brackets). Placed first, you will see the food's group or type or category. key in the food preparation method, i.e., /RAW, /COOKED, /BAKED, etc. does make it easier to read, and might be continued for continuity. Food Description, but modified to be unique. of the abbreviations used in the FOODFILE database. move the cursor to the next data item. your reference books, or on the food's Nutrition Label. APPENDIX E with a breakdown of each into subgroups. would have the Food Group code of DN. Press TAB to continue. to the next data item. maximum of 3 digits for the gram weight, and press TAB. necessary. Press TAB to move from one nutrient to the next. measurable amount; or, the nutrient's value is not measurable. next item by pressing TAB. the TAB key is the only way to move from one data item to the next. ENTER key will signal NUTRIENT that the data is to be saved. ADD ANOTHER FOOD (Y or N)? 1. FOOD LABELS of major food manufacturers and distributors. heading: NUTRITION INFORMATION PER SERVING:. can be found in the reference books listed in APPENDIX G.
Enter Food Number to Delete (0 to end)? this screen will be erased and NUTRIENT's MENU will be displayed. In other words, you have been exited from the DELETE A FOOD routine. If SAMPLE FOOD is the food you want deleted, ENTER the letter Y.
DELETE A FOOD routine, and return to the main menu. If SAMPLE FOOD is not the food you want deleted, ENTER the letter N.
The ### represents the maximum record number of the current database. The message will be erased, and you can enter another Food No.. Enter Food Number to Change (0 to end)? a valid Food No.. One of three things will happen. Shortly, the message will be erased & you can enter another Food No. be erased and you can try again. require the same key entries, BACKSPACE, TAB, and the ENTER key. ENTER key will signal NUTRIENT that the data changed is to be saved. CHANGE ANOTHER FOOD (Y or N)? If you enter an N, for NO, you will be returned to the main menu. 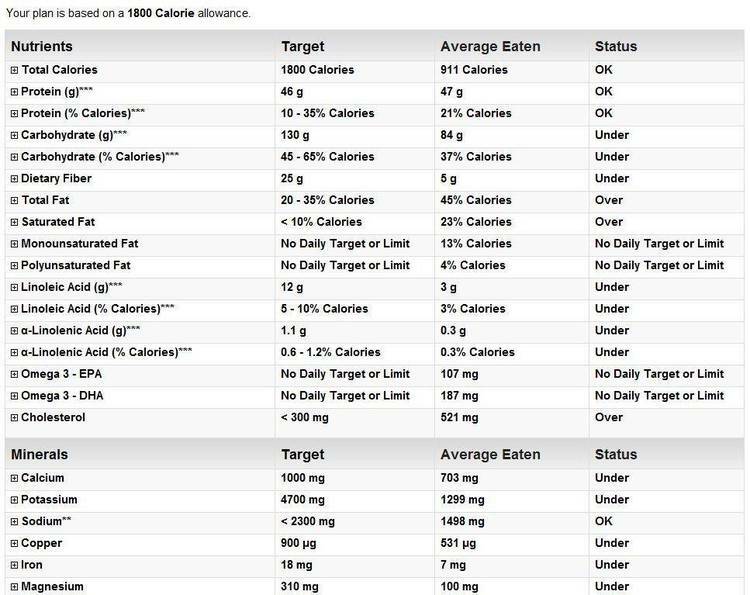 single food and its nutrient data, or display a food group. Enter Food Number to display (0 to end)? only the DAIRY/MILK group and its subgroups will be presented here. GROUP FOOD DESCRIPTION FOOD NO. Display more (Y or N) ? particular subgroup or subset of a group will vary in their length. you do not want to see more of the subgroup being displayed, press N.
Continue DISPLAY Routines (Y or N) ? DISPLAY SCREEN 3-option menu; press N to return to NUTRIENT's MENU. see a screen similar to the screens representing the subgroups. used to represent the entire group. The "Display more (Y or N) ? " SCREEN, DISPLAY FOOD(s) screen, and each FOOD GROUP screen. Continue sorting (Y or N) ? routines and present NUTRIENT's MENU. You have entered the DISPLAY routine's FOOD INTAKE ANALYSIS option. FOOD MAN's file not found. Try Again. FOOD MAN is used to represent the individual's name you would enter. The message will be erased, and another NAME & DATE can be entered. screen will now be discussed. this is because height was requested to be entered without shoes. inch heels, and 157-170 is its respective weight range. graph where 100 percent and 300 percent of the RDA would be. This is the prompt line of the DISPLAY FOOD INTAKE ANALYSIS screen. Enter another person's NAME to display another Food Intake Analysis.